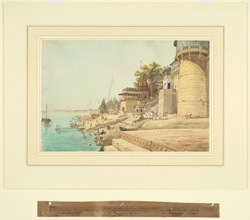 This view was lithographed by L. Haghe in Prinsep's 'Benares illustrated', 1st series, in which Prinsep's description states: 'On the right is the house of Punditayun, the widow of Bisumbhur Pundit, a Vakeel or Envoy of Nagpoor'. Prinsep shows the unfinished left bastion now known as the Ganga Mahal. In the centre is the temple built by 'Ghuna Baee, a Marhatta lady, in honour of the Goddess Shunkuta Debee' on the Sankata Ghat. Beyond is Biresvar Ghat, the original name for Sindhia's Ghat, begun in 1829, and then two of Ahalya Bhai's temples on the Manikarnika Ghat. Rajbuluhbh Shiwala is unclear, it may mean a third Ahalya Bhai temple, as she is credited with three in 'Benares illustrated'.